This was the setting for the Hollywood themed La Mesa Chamber of Commerce’s 6th Annual Local Heroes. 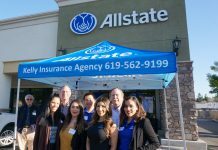 There was a full house at the Town & Country Resort Hotel on Feb. 19, with night full of entertainment, silent auctions, business networking and honoring outstanding people in the La Mesa community. Mayor Art Madrid did the honors of swearing in the Chambers’ 2014 Board of Directors and each of them received Certificates of Recognition from Reps. Susan Davis and Duncan Hunter Jr., Sen. Joel Anderson, Assemblywoman Shirley Weber, County Board of Supervisors Dianne Jacob and the City of La Mesa Mayor Art Madrid and Council Members Dr. Mark Arapostathis, Ernie Ewin and Ruth Sterling. But the night was in recognizing some of La Mesa’s local heroes. 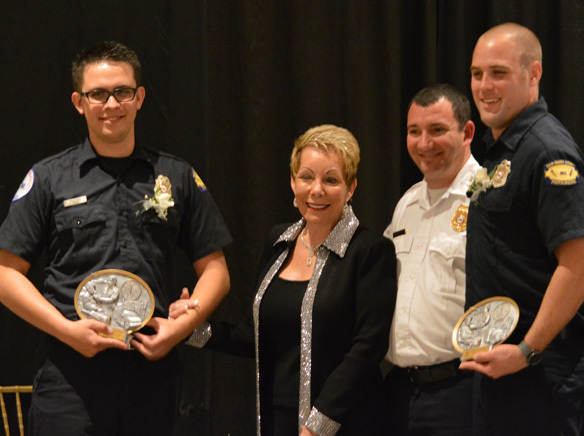 Honored for exemplary performance was American Medical Response paramedics Trevor Davies and Gabe Robinson. Davies has worked in La Mesa and East County for five years, but it was his lifesaving skills he demonstrated in saving a man’s life at last year’s Annual Oktoberfest that earned him the honor. Found without a pulse and not breathing it took Davies two attempts before the patient was stabilized, breathing and conscience. 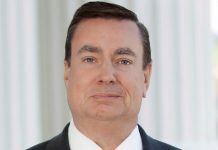 Davies has a history of treating patients with respect and kindness and many patient testimonials thanking him for his service to the community. Robinson was dispatched in 2013 to an active shooting scene, where under extreme duress he was able to triage injured patients, one who would have died without immediate attention. Robinson is able to perform under the most difficult of circumstances and answers every response with the highest degree of professionalism. A 27-year veteran of the fire service and heavily involved in the La Mesa Fire Explorer Program, Dan Lachenbruch, Heartland Fire & Rescue fire engineer, is credited for shaping the lives of many young people through he Explorer program along with his duties as a first responder to East County’s devastating fire storms. In the 2007 fire storms, while battling the Harris Fire, the Witch Fire destroyed his personal home in Rancho Bernardo. He is recognized by his peers and was awarded the Fired Department Employee of the Year in 2012. La Mesa Police Department Officer Ryan Rogers was noted as not only a “team player” but lived by his commitment to community service. In 2013, Rogers broke the LMPDDUI arrest record by arresting 130 DUI arrest. He was named Officer of the Year for 2013. LMPD Community Service Officer Maria Vita, honored for her sharp and professional help, working alongside LMPD police officers. She contributed her service and skills in helping to work professionally at crime scenes, investigation of a vehicle burglary case including interviewing, reviewing surveillance tapes which led to an arrest. Retired Senior Volunteer Patrol volunteers Catalina Branch and Jerry Frosio were honored for hours of community service, in which both aided the LMPD in investigations and community service opportunities. Branch donated 3,400 hours since 2006 and Frosio donated 6,400 hours—to date. 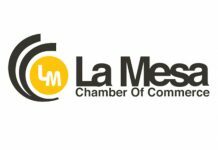 Mary England, La Mesa Chamber of Commerce CEO, said that she is astounded at what these local heroes have done in serving the community and also in five short years, the milestones that the Chamber has made in making a tremendous impact in the city of La Mesa. Local community heroes received Certificates of Recognition from all of the representatives at the annual awards dinner, an engraved plaque from the Chamber, two tickets to East County’s renowned 6th Annual Taste of La Mesa, a commemorative 2013 Oktoberfest gift, fire bags donated by ServiceMaster All Phase Restoration and gifts from All Things Bright and British.